As Jane Alison writes in the introduction to her insightful and appealing book about the craft of writing: "For centuries there's been one path through fiction we're most likely to travel-- one we're actually told to follow--and that's the dramatic arc: a situation arises, grows tense, reaches a peak, subsides . . . But something that swells and tautens until climax, then collapses? Bit masculosexual, no? So many other patterns run through nature, tracing other deep motions in life. Why not draw on them, too?" W. G. Sebald's Emigrants was the first novel to show Alison how forward momentum can be created by way of pattern, rather than the traditional arc-- or, in nature, wave. Other writers of nonlinear prose considered in her "museum of specimens" include Nicholson Baker, Anne Carson, Marguerite Duras, Gabriel Garc a M rquez, Jamaica Kincaid, Clarice Lispector, Susan Minot, David Mitchell, Caryl Phillips, and Mary Robison. 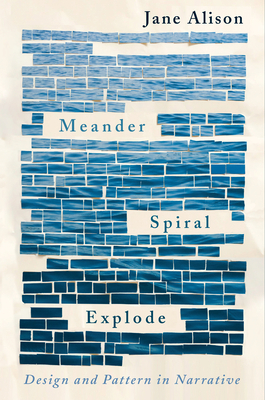 Meander, Spiral, Explode is a singular and brilliant elucidation of literary strategies that also brings high spirits and wit to its original conclusions. It is a liberating manifesto that says, Let's leave the outdated modes behind and, in thinking of new modes, bring feeling back to experimentation. It will appeal to serious readers and writers alike. JANE ALISON is the author of a memoir, The Sisters Antipodes, and four novels--The Love-Artist, The Marriage of the Sea, Natives and Exotics, and Nine Island--and is also the translator of Ovid's stories of sexual transformation, Change Me. She is professor of creative writing at the University of Virginia and lives in Charlottesville. Find out more at www.janealisonauthor.com.